On Jan. 22-23, instructors and directors of the voting membership of Drum Corps International will meet in Indianapolis to discuss eight new rule proposals as part of the annual DCI winter business meetings. DCI.org columnist Michael Boo breaks down each of the items that will be considered and gives his insight and opinions on how passage of each rule might affect the direction of the drum corps activity. Read Part I of this series. Read Part II of this series. Field Visual Sheet Change. Judge George Oliviero has offered a proposal to, "Create a field visual sheet that is parallel in structure to the other visual sheets. This means that the field visual sheet will be clearly separated into a 'what' and 'how' sheet. The three other visual sheets have a similar consideration of what/how." Simply, this proposal is an attempt to clarify how the field visual judges perceive the caption. This change would further assist those judges in quantifying their observations on the sheets and on their recordings that are then shared with the corps instructors. I don't suspect that there will be much if any dissention to this proposal as the adjudication sheets are periodically tweaked and refined to eliminate confusion and make things more clear. percussion lines during DCI competitions. The Cadets' George Hopkins proposes that the percussion judge be located in the press box instead of roaming the field throughout a performance in an effort to "standardize the approach and viewing of the percussion programs." He notes that removing the judge from the field will result in no more "distraction of the percussion judge running in and out of the forms." Judges attempting to get "inside" the drum lines, both physically and musically, have long been a distraction for corps and for fans. For fans, it might be comparable to attending a Broadway production and watching a New York Times theater critic roving throughout the actors on stage, tape recorder in hand, making comments to put in his/her next column. For the field judges, they constantly have to dodge quick direction changes from drummers and brass players, as well as color guard equipment and a variety of other obstacles, all while attempting to concentrate on the percussion performance. To this end, it can be argued that having a judge on the field can be a danger to both the judge and the marching members. However, it's generally been accepted that evaluating from the field is the best way of digging into the minutia of how well a drum line is performing, that judging the percussion section from afar doesn't allow judges to separate the competing lines by a split hair if necessary. 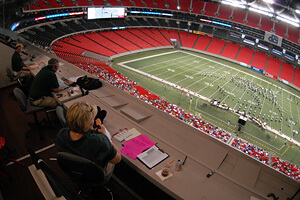 Many band contests are adjudicated with the percussion judge sitting in the stands or the press box, and these judges have to adjust to picking up on performance intricacies from a distance. Drum corps purists may insist that the only way to really get a good "read" is to be on the field, as close as possible with the drum line battery. 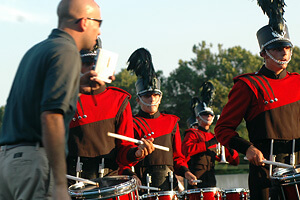 Percussion judges on the field and/or in the stands have long been experimented with and discussed in various rules proposals over the years. Obviously the most spirited discussion on this topic will be among percussion staff members in Indianapolis this week, and considering that there's been a field percussion judge as a fixture in DCI competitions for decades, I would be surprised if this proposal makes it through. press box during the 2009 season. This proposal by George Hopkins has been brought forward in one form or another in previous years, and would create the positions of two Overall General Effect judges, replacing the current single Visual Effect judge and the single Music Effect judge. It's an idea that has long been considered, but never seems to gain any traction. Hopkins notes, "Corps are designing programs that have much greater effect because of the combined efforts, thoughts and presentation of music and visual as one. Their programs will receive commentary based more upon what each individual performer/ensemble of performers is constantly attempting through simultaneous efforts of movement/music/expression, and the level of achieved synthesis of these efforts." Such Overall General Effect judges would "assess the corps' entire presentation with no particular caption focus—much like the audience—and will adjudicate it based upon the balance of all aspects (design and performance) presented." Hopkins rightly points out, "Current General Effect judges will need to become skilled in additional aspects of our activity's disciplines of music and visual. Judges should be assigned who understand the dynamics of programs designed to mesh music and visual into seamless and complimentary presentations." The idea of judges being thoroughly versed in all disciplines is noble. But I suspect that the instructors and judges alike recognize that few people have the thorough background to adequately discuss and score the elements currently residing on the Music Effect and Visual Effect sheets. Indeed, as Hopkins suggests, the audience already typically assesses the effect of each corps' entire production. But while doing so, the fans generally are not focusing on each element of Effect in order to assign a score. Some interesting discussion on this proposal (which was also on the table in 2009) may be brought forward in Indianapolis this weekend since the Judges Advisory Committee actually trialed the system during the summer of 2009. However, I believe for this proposal to gain more support from instructors and judges, people will need to become more holistically trained in the entire drum corps adjudication experience in order for it to work. For now, it may well be an idea ahead of its time. Seven Judge System. George Hopkins' final proposal is to create a judging panel of seven judges, as opposed to the current system of eight judges at most contests and 10 judges at World Championship and other Premier Events. A total of 10 points would be assigned to each the Brass Performance, Percussion Performance and Color Guard Performance judges, with the Brass judge on the field and the other two in the press box. Both the Ensemble Music and Ensemble Visual judges would have 15 points to work with. Each of two Overall Effect judges would have 20 points on their sheets. The responsibility of the Overall General Effect judges is spelled out in Hopkins' proposal above. The responsibilities of the three Performance judges would likely be similar (if not identical) as to the ones currently utilized. What's missing here in comparison to the current system is the Field Visual judge. The Ensemble Visual judge would likely absorb those responsibilities. Since the system outlined in this proposal relies upon the concept of the use of Overall General Effect judges, I suspect that like the proposal above, this one will have a steep uphill climb in order to be passed. At the annual DCI winter business meetings (Jan. 22-23, in Indianapolis), corps instructors will meet in caucus sessions to further discuss all eight of the the 2010 rules proposals up for review. Staff members from each eligible corps (World Class member corps and 2009 Open Class finalists) will be polled for a recommendation on whether or not the proposal should be passed along to the full membership to debate, discuss and eventually vote on in the final round of the rules change process. Stay posted to DCI.org Saturday evening for the final voting tallies.